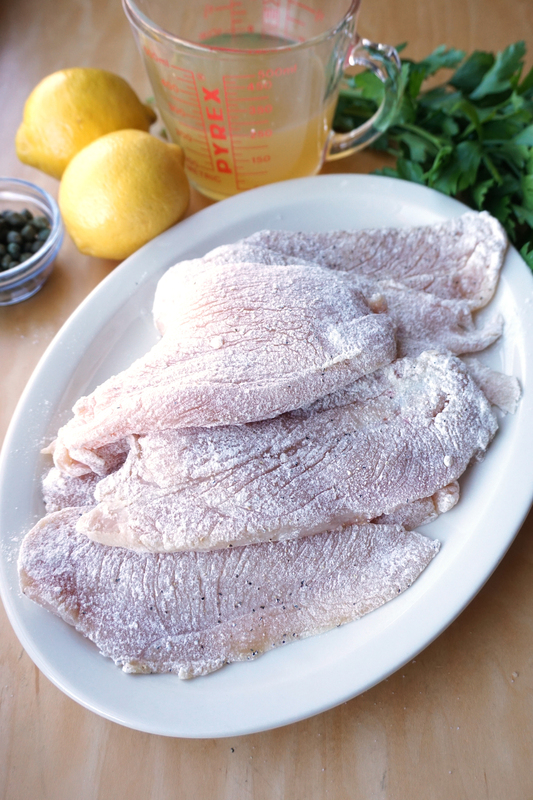 Piccata is a method of preparing food. Meat is sliced, coated, sautéed and served in a sauce. In this case, chicken breast is butterflied, seasoned and dredged in flour before it’s browned in butter. The sauce is made with the pan drippings, lemon juice, capers, and white wine. It’s amazing. - Each chicken breast has a tender on the bottom side. You can see it running along the side of each breast. Remove this, and flip each breast back over. Butterfly each breast, meaning to slice it horizontally in half. If you like, you can pound each breast half between 2 sheets of plastic wrap or parchment paper, but I found that butterflying them was sufficient. - Season all the chicken with salt, pepper, and garlic powder. - Pour the all-purpose or almond flour into a large shallow dish. Season it lightly, and dredge both sides of each piece of chicken in the flour. Shake off the excess flour and place them onto a fresh plate. - Mince your garlic and slice your onion into thin ribbons. Squeeze the juice of about 2 large lemons, and rinse and drain your capers. Have all this ready and it’ll make the whole cooking process so easy! - In a large skillet, melt 2 tbsp of butter and the EVOO. 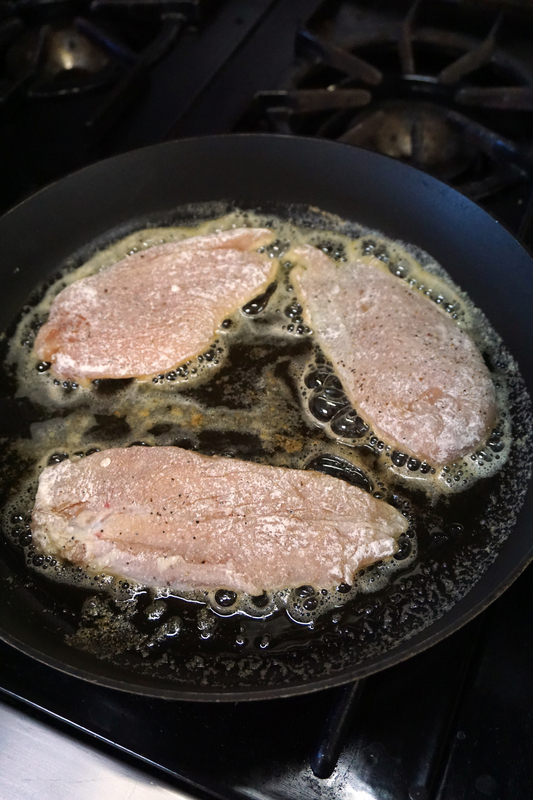 With the heat on medium-high, fry the chicken breasts in the hot oil. This should take about 5 minutes per side, and they should be just cooked thru with a gorgeous golden brown crust. Transfer the cooked chicken breasts to a plate. - Add the remaining 2 tbsp of butter to the skillet, and add the garlic and capers. Pour in the lemon juice, wine, and chicken stock and allow it to come to a gentle boil. Scrape all the brown bits from frying the chicken and allow them to be incorporated into the sauce. Season the sauce with salt and pepper and taste for adjustments. Dump your sliced onions into this simmering sauce, and gently place all the chicken breasts back into the skillet. - The sauce should start to reduce and thicken slightly, coating the chicken breasts in gloriousness. Allow everything to meld and heat back up for about 5 minutes, and serve! Top with tons of chopped parsley and lemon slices. This is great over pasta, or like I’ve been having..over quinoa or zucchini noodles.